EAST MILLINOCKET, COLD STREAM POND, AND ST. AUGUSTINE, FLA. – Wakine G. Tanous passed away peacefully surrounded by his family on Nov. 7, 2013. How beautiful it was that his birth to eternity fell on the day of his 82nd birthday. Wakine was born Nov. 7, 1931, in Van Buren, the son of Thomas Tanous and Alice (Shalala) Tanous, the fourth eldest of eight boys. He attended and graduated from Van Buren schools and worked in the potato fields with his brothers every year. After graduating from Van Buren Boys High School he went to Boston College, where he earned a B.S. 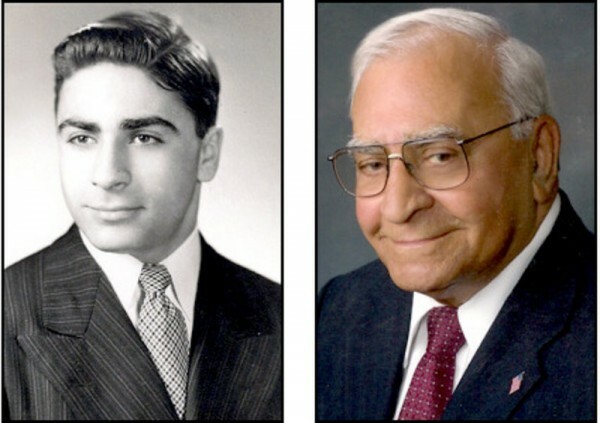 degree, and then to Portland University School of Law and became the youngest lawyer in the state of Maine in 1955. Wakine married the love of his life, Anna D. McKeon, who he met while attending law school in Portland. They married in 1955 at St. Dominic’s Church. Soon after they relocated to East Millinocket, where he established his law firm and they raised their family. Wakine was a communicant of St. Peter’s Parish where he served on the Knights of Columbus, taught religious education classes, and did major fundraising for the construction of the current church building on Cedar Street. An accomplished Eagle Scout, he was awarded the Silver Beaver Badge; he was past president of the Pine Tree Council, Boy Scouts of America, and helped establish Troop No. 55, BSA, in East Millinocket. Wakine helped to establish the East Millinocket Chamber of Commerce as the founding president, was a member of Kiwanis, was instrumental in creating the Maine Snowmobile Association as well as Katahdin Friends, Inc.; served as a board member of EMMC Health Care System and Millinocket Regional Hospital; was a corporator of Bangor Savings Bank and founding member and past president of the Alex Tanous Foundation where he served as clerk for 22 years. Wakine was a very proud member of the Maine State Bar Association, Penobscot Bar Association, and Maine Trial Lawyers Association. He faithfully attended the annual Red Mass held at the Cathedral in Portland. He was fully involved in and had a great love for the Katahdin Region community and its various activities, especially playing pitch at the Pitch Club and following his children’s and grandchildren’s sporting events and activities throughout the state. Wakine was recently bestowed the honor being named a Pillar of the Community along with his lifelong friends, David Bartlett, Dr. Frank Civiello, and Dr. Irvin Hamlin. We all know Wakine had a passion for politics, and began his political career as a state senator in 1968 and continued to 1974 when he ran for governor for the state of Maine. In the Maine Senate he served as Chairman for the Judiciary and Labor Committees, where he sponsored a bill to create workers compensation for Maine employees, and created legislation granting collective bargaining rights to state of Maine employees. He continued to be a sounding board for Maine’s Federal and State political leaders-Democrats, Republicans, and Independents alike. His family spent their summers on Cold Stream Pond at their camp in Enfield since 1965, where he had many memories entertaining family and friends, hosting lamb barbecues, playing cards with the neighbors and coordinating the local Horseshoe Association. He and his wife, Anna, spent their winters in St. Augustine, Fla., since 1996. They truly enjoyed the lifelong friends they made there. Wakine perfected his hobbies of gardening and cooking during his later years and most enjoyed big family and friend gatherings where he provided food for everyone who walked through the door. He is survived by his beloved children, Greg and his wife, Sharon Tanous, Arlene McCracken and her husband, Lance, Theresa Rodriguez and her husband, Ray, Nolan and his wife, Carol Tanous, Alice Kelley and her husband, Joseph, Wakine Jr. and companion, Tracey Cousineau, and Peter Tanous; his brother, Thomas Tanous and his wife, Esther; sister-in-law, Marcia Farr and her husband, Don; sister-in-law, Cynthia Tanous and her husband, Richard Marx; brothers-in-law, Joseph McKeon, and Edward and Carol McKeon; grandchildren, Eric and Casey Kelley, Sara Lynn, Taryn and Haley McCracken, Chris and Alex Rodriguez, Taylor, Derrick and Natalie Tanous, Nicole Wills and husband, AJ, and Nicholas Tanous and partner, Emily Doyle; and his newest addition great-granddaughter, Audriana Tanous. Wakine adored his many nieces and nephews who visited frequently, especially Karen Tanous, who has been caring for him since August. Wakine was predeceased by his wife of 52 years, Anna D. (McKeon) Tanous; his brothers, Alexander, Joseph, Charles, Nolan, Nagel, and David; sister-in-law, Evangeline; as well as his brothers-in-law, Paul McKeon, and Thomas McKeon; sisters-in-law, Camilla McKeon, Mary Limauro, Agnes Valeriani, Ella McKeon, and Theresa Manette. The family would like to extend a special thank you to CHCS Home Health and Hospice; Betty, Jill, Rebecca, Debbie, Sherry, Donna, and Jeannette, and home health aide Donna Duffy. Friends are invited to visit with the family 2-8 p.m. Monday, Nov. 11, at Lamson Funeral Home, 11 Tamarack St., Millinocket. A Mass of Christian burial will be celebrated 11 a.m. Tuesday, Nov. 12, at Christ the Divine Mercy Parish at St. Peter’s Catholic Church, 58 Cedar St., East Millinocket, with the Rev. Bob Vaillancourt, presider. Interment will be at East Millinocket Cemetery. Gifts in memory of Wakine may be sent to Katahdin Area Support Group, P.O. Box 374, Millinocket, ME 04462; or to the American Heart Association, 6 E. Merrill Road, Lewiston, ME 04240. Interment will be at East Millinocket Cemetery. Messages of condolence may be expressed at www.lamsonfh.com.